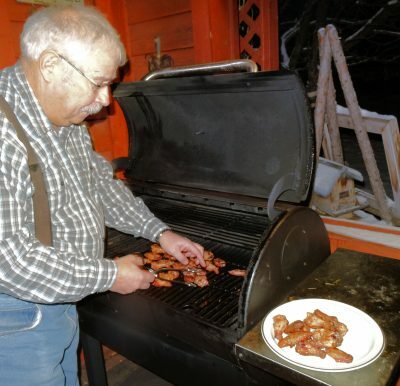 I spend a lot of time on Smoking Meat Forums which is a great source for expertise on smoking meat and meeting great foodies. 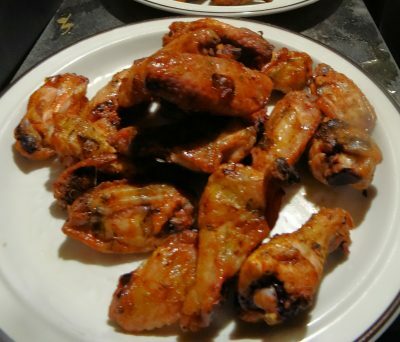 One of the famous recipes on the forums is Scarbelly Wings. He named it after a stalwart of the forums who passed away. The result is so good I had to post it but I have adjusted it to Canadian tastes which means it isn’t quite as hot. I also use my own Creole Seasoning instead of a commercial one. I cook them at a higher temperature as well. I started by mixing Cajun Injector Creole Butter with Frank’s Red Hot Sauce. Then I injected some of that mixture into each wing segment with a syringe injector. I did it over a casserole dish to catch any that squirted out. I poured the remaining sauce over the chicken segments and then dusted them with Creole spice. I preheated my Louisiana Grills pellet smoker to 350 F and put the wings on for 25 minutes. I flipped them and cooked for 25 minutes more. These can also be cooked in an oven or a gas grill set up for indirect cooking. These are the best wings I’ve made. They have that buffalo wing taste from the Frank’s Red Hot sauce, a nice touch of complex Creole flavours and a great crispy skin. They have some heat but even She Who Must Be Obeyed liked them as I cut back on the amount of hot sauce. My friend and photographer Bill described them as “darn tasty”! Thanks so much to Smoking Meat Forums and S2K9K for this great recipe. Mix the Creole Butter and Hot Sauce together. Put the wings in a casserole and inject each segment with the mixture using a syringe injector. Pour the remaining sauce over the wings and toss. Sprinkle the Creole spice over both sides of the wings. Preheat an oven or smoker to 350 F. Alternatively, set up a gas grill for indirect cooking. If cooking in a gas grill cook until the skin is crisp and the meat is cooked through. Make sure the internal temperature is over 170 F.
Oooh, yum! I love wings. What a great tribute! I was a traveler in the night from south of the border, Canadian that is,Ahh. On my quest of my first Maple Leaf bonspiel.. taken in by some othe the most gracious humans on earth, I was invited to stay and enjoy the gift of The Old Fat Guy and his talented wife. Great food but greater hospitality. Thanks and will get better throwin the stone. Har! You are welcome at Passing Wind Estates any time. As always David you make me hungry. I really need to try this one. Thanks! It is a great recipe, Sam. I hope you like it. Best wings I have ever made!